This week, you will be engaging in a war of words between Wolpert’s ELA classes. You will be drawing a topic out of a “hat” and writing a group-created persuasive essay. Your essay will then be pitted against 1-2 teams from another class. A judge will then determine which of the two essays is the most informative, highest level, and most persuasive of the two. The class with the most winning essays will win a free day and treat, courtesy of Mrs. Wolpert. Writing - Pacing advice: have the rough draft completed by this time so you can spend Friday today commenting, editing, and revising. Watch your choice of videos to learn how to make your foldable. Select your paper and fold your exterior of your project so that you are ready to fill it in with content during the days we are not in the classroom. DO NOT ASSEMBLE IT WITHOUT THE CONTENT FILLED IN. We must keep transporting your project, so it needs to be able to lay flat. 1, 6, 7, 8, Lunch, 2, 3, 4. It's a funky week with testing. Here's a screenshot of our wacky schedule, if it helps understand anything. So what you're looking at is a normal Monday. 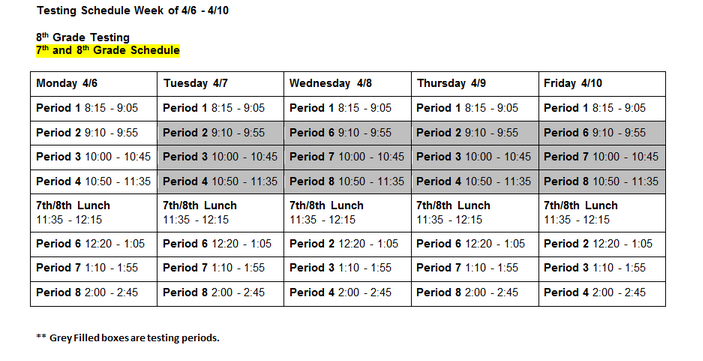 From there, Period 1 is the same all week. From Period 2 - Lunch, you are in SBAC testing. Lunch is the same all week. Then, I see you two more times for 45 minutes each time. Hope this helps! I don't see you guys this day. Poetry: Billy Collins' "Introduction to Poetry"
Taylor Mali's "Totally, Like, Whatever, You Know"
Poetry: John Norris' "For Julia, in Deep Water"
Jay Leeming's "Man Writes Poem"
Poetry: "The Midnight Ride of Paul Revere"
QRF "The Midnight Ride of Paul Revere"
Movie Analyses: "The Song of the Sea," "Shakespeare in Love,"
TEDxYouth - What makes a good oral presentation? What makes a good Powerpoint/Presentation/Visual? What makes a good Powerpoint or Google Presentation? This week, we are working on research for our advocacy speeches. We should be blending everything we know at this point: informational writing, narrative description, argument and persuasive word choice, citing sources, hyperlinking, paragraph structure, variety of text structures, everything. On Wed, you will decide who will be writing what part of your speech, but everyone will spend the week researching in order to help the level of overall presentation. This means that you will also be creating a collaborative research library. It will go on your League Website and each entry should be color coded to reflect each student's contributions. Research - Focus on problem as it exists today and find evidence of the importance of the issue. Perhaps find evidence that can help you predict the future of this issue if something isn't done about the problem. Research - Focus on solutions that already exist and brainstorm with your league ways to solve the problem. Research and break down the cost of your solution. Keep a spreadsheet of possible expenses. DUE: Complete the Collaborative Problem Statement during class and submit via submission form by end of class. Distribution of Responsibilities: What does that mean? DUE: Problem Statements by end of class (submit via submission form) - the only way you can join a superhero league is if you turn in a problem statement! SSR - What are you reading these days? Coming next week: Forming our Superhero Leagues!!! How will you incorporate what you learned into your narrative? DUE: Hardcopy Picture of your Superhero in costume! Scientific Research begins for your science-fiction origin stories! DUE: Blog post #2 "Which superpower would you most like to have, and which one would be a curse?" - remember to submit via the shared Google Form. What is the purpose of your portfolio? Research and Rough Drafts Begin!